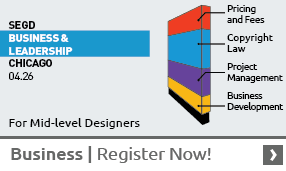 E&E, Exhibition & Experience Design Event—Last Chance! For the first time in two years, a broad SEGD community of exhibition designers, curators, technology integrators, fabricators, brand managers, design faculty and students will convene at the Exhibition & Experience Designevent. 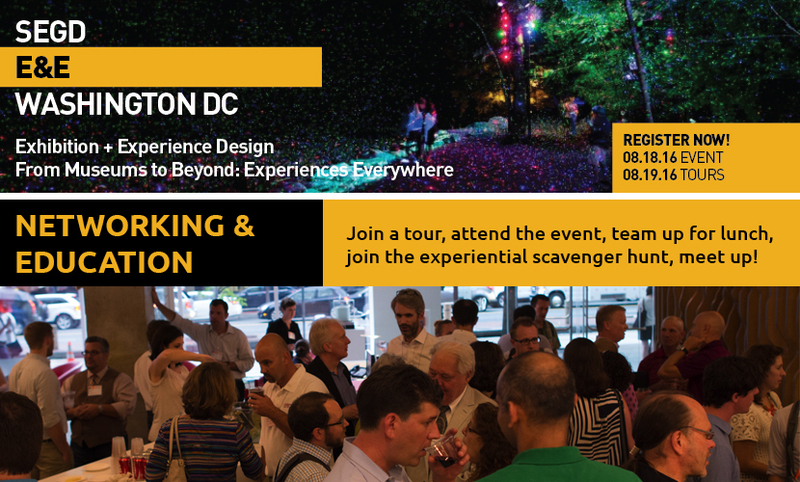 These SEGD exclusive tours of local DC exhibitions and experiences will be held the day after the E&E sessions, on Friday, August 19 from 9 am - 12 pm, and will be followed at 2 pm by a special experiential scavenger hunt brought to you by Gallagher & Associates. E&E is only 2 weeks away, so if you haven't registered and signed up for a tour, let us be your guide! You've probably heard of Abbott Miller before. He's a design legend, having done many notable projects, written several books and garnered many accolades. He's also an SEGD member. Are you ready for a fresh perspective on corporate visitor experiences? 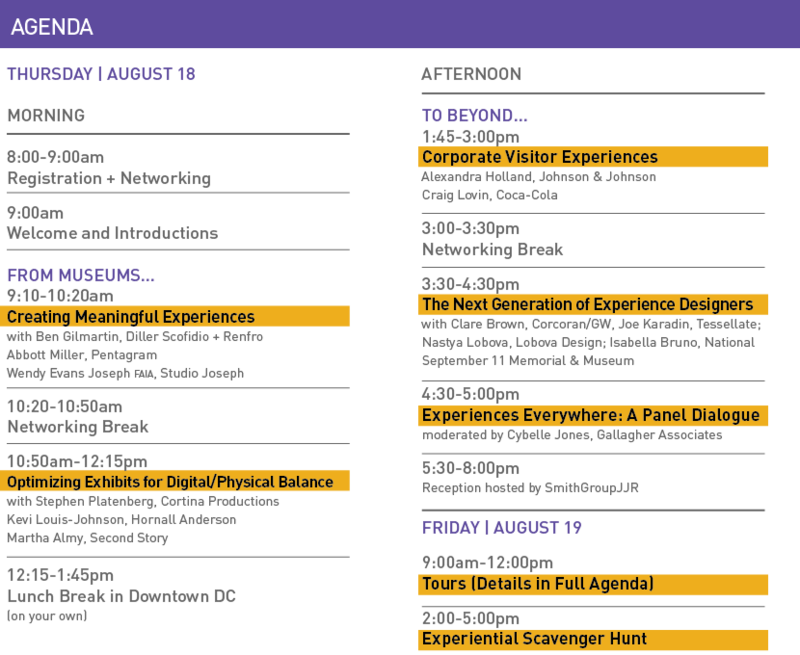 Don't miss the session led by Craig Lovin from the World of Coca-Cola and Alexandra Holland from Johnson & Johnson on August 18th at the 2016 SEGD E&E: Exhibition & Experience Design event in Washington, DC! We wouldn't dare pretend that this is a definitive list, but it is a list of the projects that the top exhibit designers see as influential and important projects that have helped to push the area of exhibition design forward. The breadth of projects that were submitted was amazing. 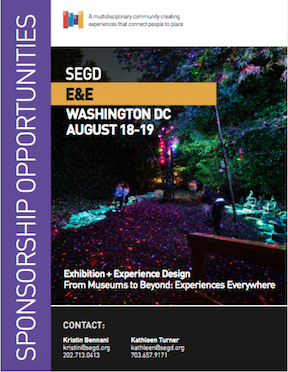 August 18-19th's Exhibitions & Experience event will feature museum and corporate design experts from the SEGD community—as well as networking, tours and an experiential scavenger hunt! All in the ultimate museum city—Washington, DC. If your practice touches experiential graphic design for exhibitions in any way, you need to be there. Click the image above to find out more. Kevi Louis-Johnson has learned that there is never a single solution to a design challenge. "Our first thoughts should be about understanding the story that is to be told, and then how best to bring that story to life." Joseph is philosophical about ways to achieve success. "There are straightforward presentations, pragmatic concerns and varied rules about presentation," says Joseph, "but ultimately, it is the unsaid, the unlikely presentation in metaphoric terms that has its way of seeping into our conscious." What are the biggest challenges and changes in exhibition design today? How are exhibitions made into meaningful experiences that stay with visitors after they leave? How do you measure the success of the visitor experience? What will the next generation of experience designers bring to the design process?